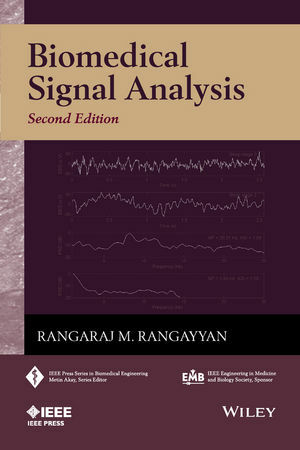 Biomedical Signal Analysis, Second Edition uses a pedagogical and illustrative approach to introduce various signal analysis techniques that are particularly important for biomedical applications. The book presents digital signal processing and pattern recognition techniques for analysis of biomedical signals. It begins with an introduction on the nature of biomedical signals, such as the action potential, electrocardiogram, muscle signals, brain signals, heart sounds, and speech. A detailed review of signals and systems is presented to set the stage for filtering of biomedical signals to remove noise and various artifacts. Several filtering techniques are presented with applications, from simple averaging to advanced and sophisticated optimal filtering methods. Techniques for detection and characterization of events and waves within a given signal are described. Several advanced techniques are described for adaptive analysis of non-stationary signals using time-frequency, wavelet, and other forms of representation. The book concludes with a chapter on pattern classification techniques that could be used in diagnostic decision-making procedures. This book will help assist readers in the development of techniques for analysis of biomedical signals and computer-aided diagnosis. Rangaraj M. Rangayyan, PhD, is Professor in the Department of Electrical and Computer Engineering and an Adjunct Professor of Surgery and Radiology at the University of Calgary in Calgary, Canada. Dr. Rangayyan has published over 150 papers in journals and 250 papers in conference proceedings, and has authored two textbooks, Biomedical Signal Analysis (Wiley-IEEE Press 2002/2015) and Biomedical Image Analysis (CRC Press 2005). He has been recognized with the 2013 IEEE Canada Outstanding Engineer Medal, and elected as a Fellow of the IEEE, Canadian Medical and Biological Engineering Society, the American Institute for Medical and Biological Medical Engineering, and other societies.